Recently the movie Up in the Air won two Buzz Awards – for Movie/Film and People’s Choice award. The Buzz Awards go to the best in brand/media integration campaigns, brilliant product placement and innovative use of a medium for a promotion. The Movie/Film award goes to the most memorable-yet natural-cameo by a brand in a motion picture, while the People’s Choice award doesn’t really need any explanation. Did Up in the Air really deserve those two awards? 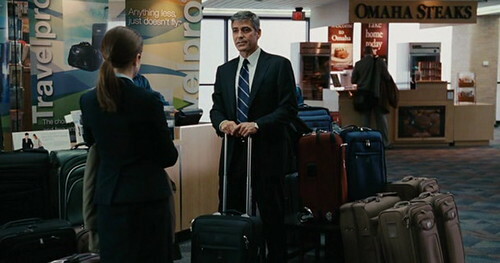 The movie is about a corporate downsizer Ryan Bingham (George Clooney) and his travels from company to company. The film follows his isolated life and the people he meets along the way. Widespread reports from the web suggest that American Airlines and Hilton placements were not paid placements. Even more, according to an article in Advertising Age, both companies are “integrated-marketing partners” for the film (that also includes running sweepstakes related to the film on their websites). Those partnerships were somehow different from traditional product placement – instead of paying for the placement in the movie, both companies allowed the crew to shoot the movie in Hilton hotels and American Airlines terminals and airplanes. With these partnerships producers saved a lot of money (the production budget for the movie was $25 million). Well, the financial part of this deal makes sense. What about the product placement itself? The movie script is made in such a way that it’s absolutely necessary that Clooney flies a lot and spends the nights in hotels. 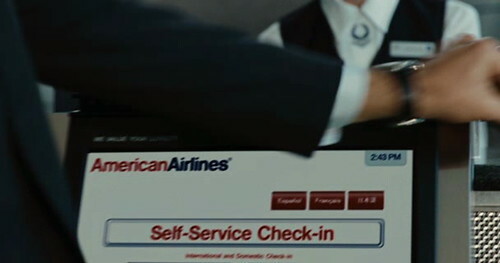 In this context Hilton and American were a natural fit (the Walter Kirn book that the movie script is based on, had Clooney’s character flying on a fictional Great West Airlines). Because Clooney’s character is a frequent flyer, it’s obvious that he’s loyal to one brand (one airline) and collecting miles is also something that you could expect from such person. For this kind of flyers being loyal to a hotel chain is probably also very likely. 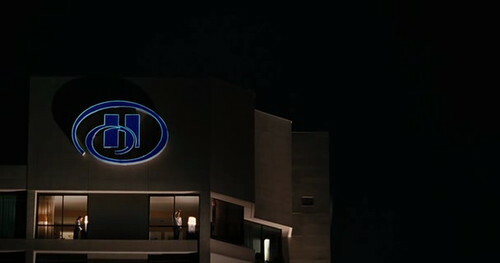 So, both brands fitted nicely and were easily integrated in the movie. Well done. Well, one bag was not theirs, but it was swapped for Travelpro’s. Do you remember in which scene?